For the sports fan who can't make up their mind try our All-Star, all sports personalized t-shirt. A great Personalized Gift for Father's Day that Dad, Grandpa or your favorite Uncle will look great wearing all day long. 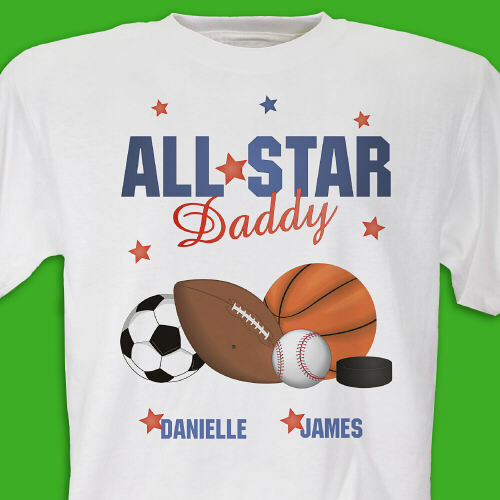 Your Personalized All Star T-shirt is Available on our premium white 100% cottonT-shirt, machine washable in adult sizes M-3XL. Sports shirts is also available in Ash Gray. Sports Fan shirt includes FREE Personalization! 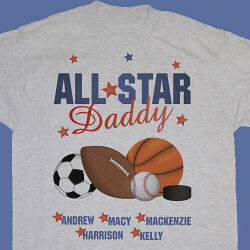 Each Personalized All Star shirt is printed with a Soccer ball, football, baseball, basketball and hockey puck. 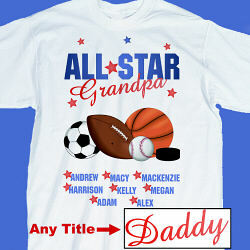 Personalize your All Star T-shirt with any title and up to 30 names. Example: "Grandpa, Dad, Papa, etc." GiftsForYouNow.com specializes in Personalized Sports Gifts for every occasion. Personalized Sports Gift for Dad, Mom, Grandma, Grandpa, Brother or Sister make great Personalized Gifts for a special Birthday, Mother's Day, Father's Day, Valentine's Day & Christmas.